Garrison Union Concert – Hello Again, Dolly! 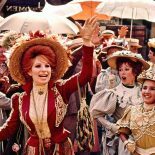 50 years ago, the kids of Garrison were paid extras in Hello, Dolly! Come celebrate with Garrison’s newest generation of talent, at the Garrison Union Free School annual Spring concert featuring a rousing Dolly! send off! Arrive early to ensure seating. Free community event. Location: Gymnasium of GUFS. 7pm.